DON'T LET THIS DEAL PASS YOU BY! 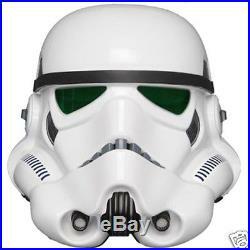 STAR WARS STORMTROOPER HELMET REPLICA COLLECTIBLE EFX EPISODE IV A NEW HOPE ANH Fearless and unswervingly loyal to the Emperor, Stormtroopers are the most recognized symbol of Imperial might. Encased in white armor over black body gloves, Stormtroopers make up the bulk of Palpatine's ground-based armies and the space-based Imperial starfleet. Their fearsome looking helmets allow the soldiers to breathe in the harshest of environments, including the vacuum of space, and are equipped with long range communications allowing these elite shock troops to be deployed with speed and efficiency to quell insurrections and maintain order across the many worlds of the Empire. The distinctive design of the Stormtrooper was originally created by concept artist Ralph McQuarrie in 1975. McQuarrie designed several versions of the look of the Empire's general infantry. Brand new & Officially Licensed. Based on an original helmet from the Lucasfilm archives. Full 1:1 Scale Replica. CHECK OUT THE RMC STORE! The item "STAR WARS STORMTROOPER HELMET REPLICA COLLECTIBLE EFX EPISODE IV A NEW HOPE ANH" is in sale since Monday, May 18, 2015. This item is in the category "Collectibles\Science Fiction & Horror\Star Wars\Products, Non-Film Specific\Costumes, Masks". The seller is "respectablemoderncollectible" and is located in Chicago, Illinois. This item can be shipped to United States, Canada, United Kingdom, Denmark, Romania, Slovakia, Bulgaria, Czech republic, Finland, Hungary, Latvia, Lithuania, Malta, Estonia, Australia, Greece, Portugal, Cyprus, Slovenia, Japan, China, Sweden, South Korea, Indonesia, Taiwan, South africa, Thailand, Belgium, France, Hong Kong, Ireland, Netherlands, Poland, Spain, Italy, Germany, Austria, Israel, Mexico, New Zealand, Philippines, Singapore, Switzerland, Norway, Saudi arabia, Ukraine, United arab emirates, Qatar, Kuwait, Bahrain, Croatia, Malaysia, Brazil, Chile, Colombia, Costa rica, Panama, Trinidad and tobago, Guatemala, Honduras, Jamaica, Antigua and barbuda, Aruba, Belize, Dominica, Grenada, Saint kitts and nevis, Saint lucia, Montserrat, Turks and caicos islands, Barbados, Bangladesh, Bermuda, Brunei darussalam, Bolivia, Ecuador, Egypt, French guiana, Guernsey, Gibraltar, Guadeloupe, Iceland, Jersey, Jordan, Cambodia, Cayman islands, Liechtenstein, Sri lanka, Luxembourg, Monaco, Macao, Martinique, Maldives, Nicaragua, Oman, Peru, Pakistan, Paraguay, Reunion, Bahamas, Viet nam.